Hey blog friends. I’m making some technical changes around here so you may see everything redirected to my old blog, elizabethcarroll.wordpress.com. Once things are complete, http://www.thinkliz.com will be hosted on my own server and elizabethcarroll.wordpress.com will no longer be a method of reaching my blog. If you haven’t done so already, please subscribe to http://www.thinkliz.com on your rss reader. In the meantime, please let me know if you see anything quirky popping up. We will try to get everything up and running without glitches soon! 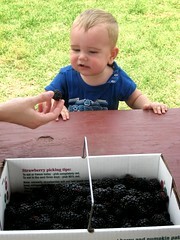 Earlier this week we packed up and headed out towards Marble Falls to do some berry pickin’ at Sweet Berry Farms. 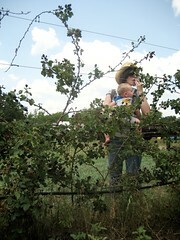 I’d never been berry picking before and we had just narrowly missed strawberry season. 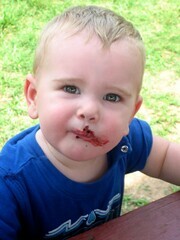 You see, strawberries don’t last long in the Texas heat. 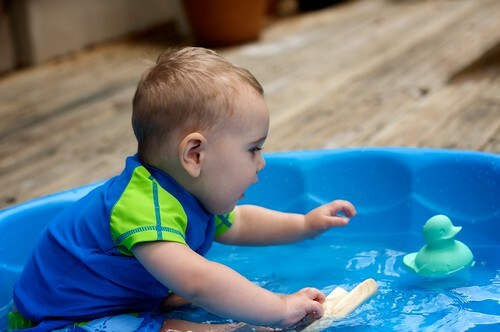 But you know what thrives in this ridiculous heat? 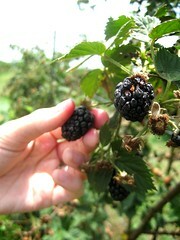 Blackberries! They grow wild in the rocky medians. They climb fences. They are often thorny and unstoppable. But they are delicious. 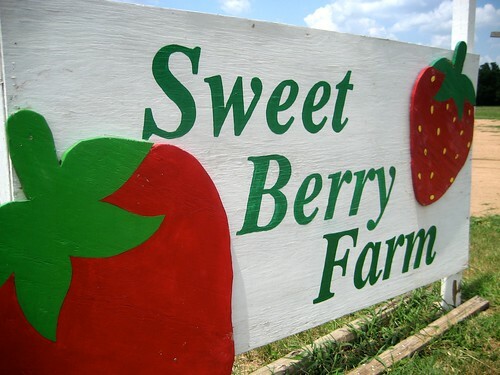 So we went to claim a pound of sun ripened sweetness. 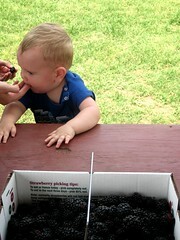 Don’t tell anyone that we ate as we picked. I mean, that’s what you’re supposed to do, right? I’m pretty sure Jude enjoyed himself as well. 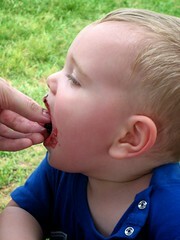 There’s nothing like a sun warmed blackberry picked right of the vine and popped into your mouth. 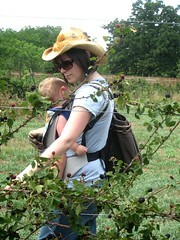 This makes me look forward to some peach pickin’ out in Fredericksburg. P.S. – Thanks to our good friend and current roommate, Christine, for taking pictures! Get ready for the zucchini recipes. 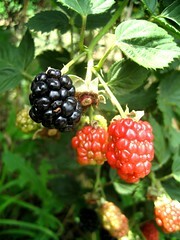 My garden is in fully swing producing them so I’ll be cooking a lot of them! First up, zucchini bread. 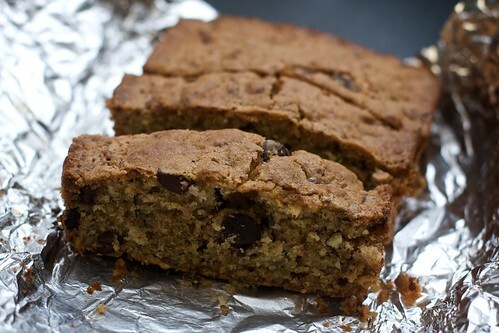 I had actually never made zucchini bread before – mainly because I didn’t really grow up eating zucchini. In fact, I don’t think it was until college that I made my first sauteed zucchini and loved them ever since. So back to zucchini bread. I figured because I had never made it, zucchini bread should be one of the first up in my zucchini adventures. I found this Paula Dean recipe and I was sold. It seemed to be kinda like a spice bread with chocolate chips. I did make a few changes to the recipes. I didn’t use orange zest, substituted toasted crushed almonds for pecans, used bittersweet chocolate chips and cut down on the sugar just a bit. When I pulled the two loaves of zucchini bread out of the oven, I was worried that it had over baked, they were so firm on the top. But thankfully they were perfect. The zucchini kept everything moist and delicious. Not a dry spot in the bread. And really, the zucchini flavor wasn’t pronounced at all but the bread was absolutely delicious! Looking forward to seeing what else I can make with the zucchini from the garden. Any suggestions? To read more about why I post these stories click here. 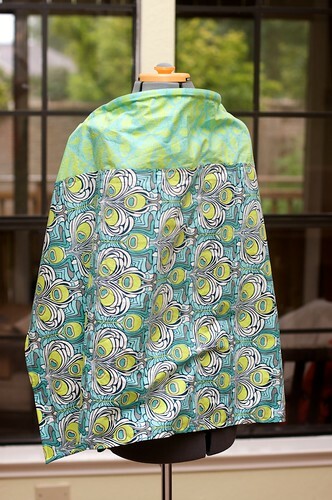 Esperance Mukasekuru is a successful weaver who lives in Karenge, Rwanda. 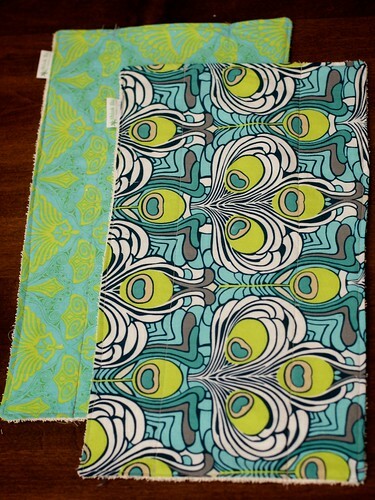 She buys used bed sheets and bed covers and then skillfully weaves colorful designs into them, increasing their value and thereby allowing her to profit from their resale. 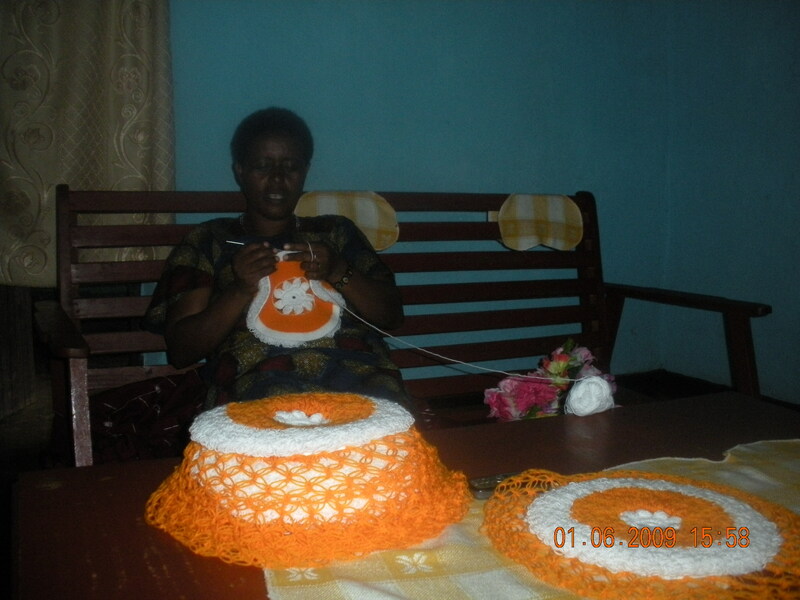 Esperance joined HOPE’s Rwandan partner, Urwego Opportunity Bank (UOB), in 2000 and received US$35 as an initial loan. 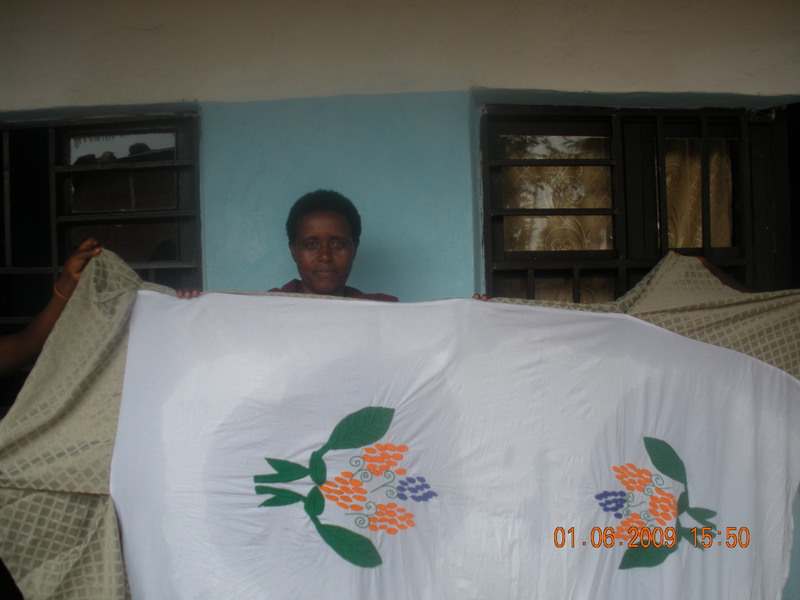 She used this loan to buy threads for making and embroidering these bedcovers, bed sheets, and hand-made tablecloths that she sells to the community. On account of her good performance in the loan cycle and her business’s success, Esperance received a larger loan during the next loan cycle. In 2001, just one year after joining one of UOB’s groups, her husband, who worked as a driver, had a car accident and broke his arm. Her husband’s recovery took two years. During that time, Esperance took up all the responsibilities of supporting her family using the revenues from her business. For example, the windows of their house previously had no glass in them, but during this time, Esperance fixed glass into the window frames. Each successive cycle, Esperance secured a larger loan than the previous one. UOB teaches its clients to save, and their savings act as an incentive to get a bigger loan the next loan cycle. Consequently, Esperance practiced saving until she was able to get a loan large enough to buy a photocopier and a computer. With these tools, she opened a new business. She makes copies of different documents for community members who need this service. In return, they pay her for her service. Because she lives near university premises, she photocopies handouts for different students who then pay her according to the size of their documents. For those students who do not have computers or time to type their theses, she charges them a fee to type them. From this new business, Esperance makes over US $143 per month. From her profits, Esperance was able to meet the needs of her six children as well as the seven orphans who stay at her house, such as providing them food and paying school fees. From Esperance’s perspective, she has 13 children under her care. Using her business, she has been able to send all her children to school. Four are studying at university, six are in secondary school, and two are in primary school. The remaining daughter received a scholarship to attend university in South Africa. Once Esperance realized the success of her business, she decided to more fully and deeply impact her community by training community women in weaving. Therefore, she formed a group of five underprivileged women who had no businesses of their own to generate income and taught them how to knit bed covers, sheets, and tablecloths as well as to make baskets and bags. The veranda of her house served as a classroom. The group turned into an association, and the women are now earning a good amount of money and can provide for their families instead of waiting for a well-wisher to give them relief. Esperance says that joining UOB helped her not only learn how to work but also gain leadership skills. In 2004, she was elected president of the trust group of which she is a member. Further, when Esperance attended a women’s meeting at the district level, the assembly wanted to elect a president. After learning that she is a president of a trust group, she was almost unanimously elected president of the District Women’s Guarantee Fund. Esperance says that joining UOB has not only benefited her in terms of economic progress but that being a member of a trust group has enhanced her relationship with God and others. She also says the fellowship with her group members—reading the Bible and praying before each meeting—has changed her life by increasing her love for others. In addition, on account of the time that she and her group members have spent in prayer together, they have cultivated a love for one another. For example, one of Esperance’s fellow trust group members lost her husband to suicide. Because of the love and respect the group members shared, the other group members decided to pay the outstanding balance of her loan. They frequently visited her during this difficult time and supported her in every way possible. Esperance’s future plan is to buy a printer and further expand her business. The printer costs approximately US$2,143. Can I just say again how much I like Patricia Bravo? This NMS used Filigree Deco Plants in Teal and Goldsmiths Work in Fresh. I think it’s just beautiful. 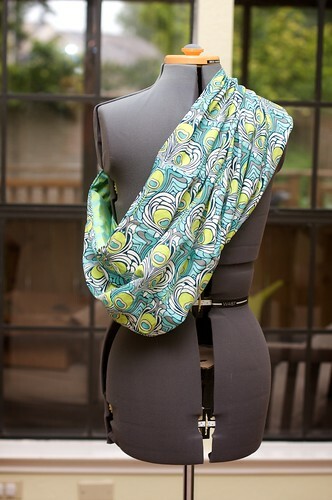 The lifesaving sling… Perfect for those early days… And the later days too! 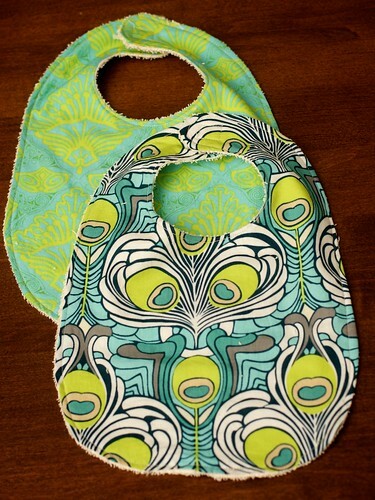 And no set is complete until the bibs and burp rags are done! There are a couple basic sets in the shop and I have plans to add a couple more this summer. Always a helpful gift for any new mama. That’s a quarter on the left. 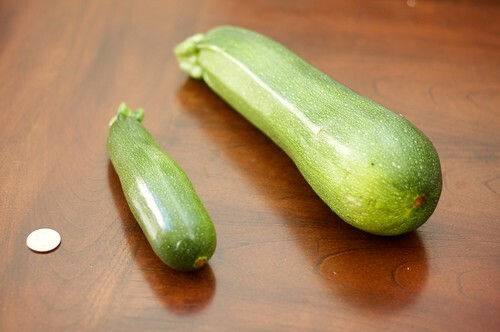 The zucchini on the left is normal sized. The one on the right is ginormous and seemed to get that way overnight. I think that I owe this success to something specific. Magic perhaps. Mater Magic. 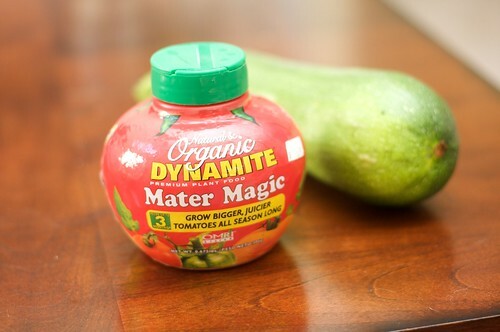 I used it at the roots of everything I planted and it seems to be supersizing everything in the garden. LOVE it. 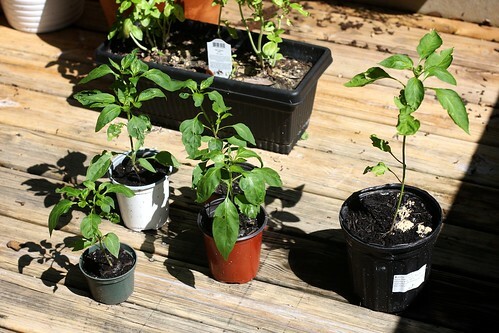 Because everything got so super sized on me, I had to remove the banana and jalapeno peppers and plant them in pots. They seem to be loving not being shaded and crowded out by the bigger bully plants. Peppers are awesome potted plants, in case you didn’t know. They don’t need much room to grow. Here are the rest of my potted beauties. Still going strong. The blackberry bush is fully leafed out and it already had a bloom! I need to find something for it to climb on. My olive tree is still doing well, and my basil seems to be chugging along. 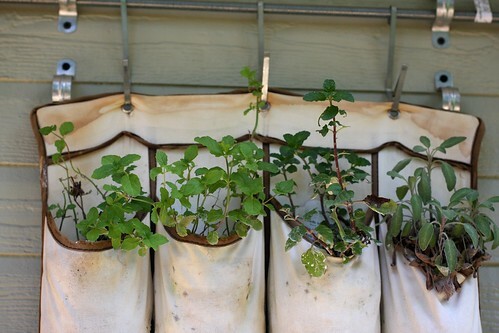 My hanging herb garden. . . I’ve gotta say that the grommets aren’t holding up super well. If you are thinking about doing this project there are a couple things you should know. If I was going to do this again, I would have folded the top over and sewed it down so that you could run a rod right through the pocket instead of allowing grommets to hold the full weight of the planter. I also would consider using a gel product, (like this) to mix in with the soil. 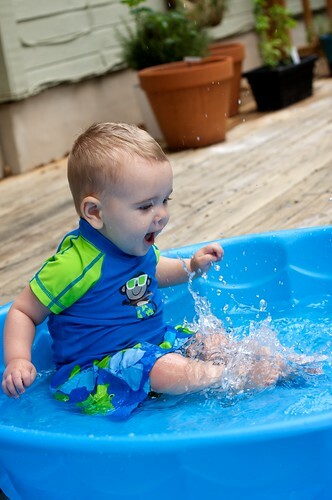 These pockets dry out so quickly that you have to water them every day. 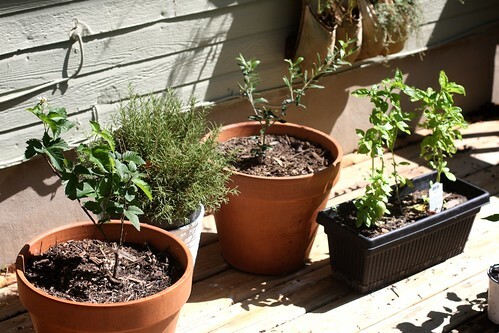 I don’t know how the herbs are going to hold up to the Austin summer heat. I’m hoping to build another planter and get them in the ground. We will see. 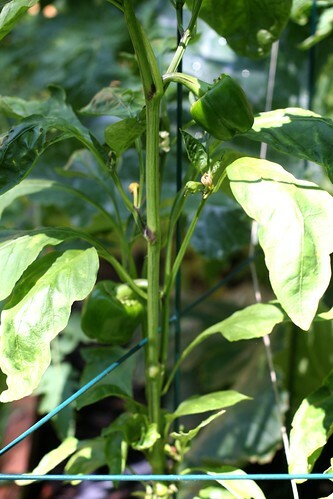 In my little 4×4 plot we are starting to see the bell peppers fruit. So exciting! Organic bell peppers are so expensive in the stores. And my yellow pear tomato plant is plotting to take over the world. It is huge, and putting out so much fruit it is insane. 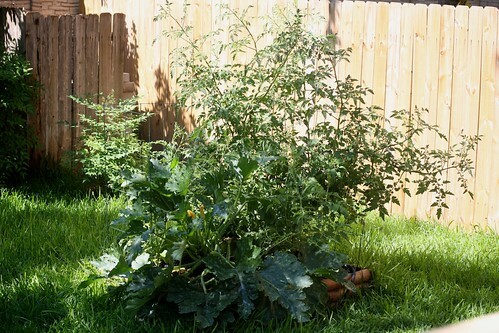 It has completely taken over my patio tomato plant. 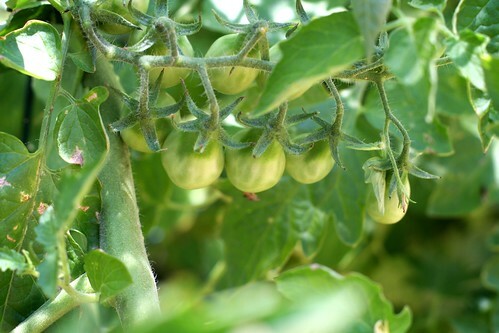 But hey, we will have a bunch of ripe tomatoes here soon!